I moved to Singapore 4 months ago, after living in the US for 3 years. However, if only I had a dime for every time someone was shell shocked about what they call a “reverse” move. Especially when I tell them it was my conscious decision to move, not because my H1B visa expired, not to accelerate my green card application, but only because I wanted to move. Coming to Ramadan, I have observed Ramadan in 4 countries at different stages of my life. I hope I can also clarify my thought process as to “Why” Singapore, why not the Middle East? Why not my own country? Why not the most powerful nation in the world? I start in chronological order. My father worked in UAE, so I spent a good part of my childhood from when I was 6 months old to 13 years of age there. Ramadan felt magical every year. It was also because of my schooling there, that me and my brother automatically integrated the 5 daily prayers and fasting in Ramadan into our daily lives early, despite having a non-practicing father and a mother who was a student of Islam herself. If it was not for our compulsory Islamic education in schools, I wouldn’t be the person I am now. My faith and practice is/was such an integral part of my being, and I am ever grateful for that. Ramadan and Eid during my childhood were magical. It is different when the whole country celebrates your faith alongside you. And I have missed that ever since. However, being Muslim is just one part of my identity. I am also an Indian. Like I mentioned before, I spent a good part of my childhood in UAE. But I didn’t have a single Arab friend, didn’t speak Arabic, and didn’t understand Arabic, while ideally I should have been fluent. This is because the government makes sure that there is a clear demarcation between us expat kids and locals. We are outsiders. However, I did have Afghan and Pakistani friends, who made sure that I was mocked for my “black” skin (I am brown though). And I acutely remember feeling that I didn’t belong, even when I was as young as 10. Recently I visited Qatar during a stopover and nothing has changed. I saw a few Malayali kids in a mall with other Indian/Malayali kids. No Arabs, no locals. You would never see one with the other. This segregation is so normal, no one even questions it. It is an amazing country, where people are relatively safe. And pays expat/immigrants well enough that the dirham to rupee conversion rate would mean your family can live comfortably in India. However, what I have a problem with is local integration. You could spend decades in any of the Middle Eastern countries and still be nobody, subjected to their ever-changing laws. Recently my uncle in Saudi Arabia had to sent his kids and wife back to India due to the new dependent’s fees. He has been working there for probably 20 years. In almost every other country, he would have had the chance to become a permanent resident, or something of the sort, that would protect him and his family from these ever-changing rules. If you spent decades toiling in a country, shouldn’t it be your home if you chose it to be? I haven’t really lived life as an adult “woman” in UAE. So, I don’t know about that aspect; however, I have heard some harrowing incidents from my cousins, so I don’t expect it to be a haven for women. This is my home country. When I moved back to India, in the 8th grade, I finally felt at home with my skin color. Yes, I was mocked for my unibrows and facial hair. But not that much for my skin color. Ramadan in India was OK. The first major difference was that in most places, I was the only practicing Muslim. Maybe in a class of 60, I was the only one fasting, and I was the only one who took prayer breaks. However, I remember fasting through exams, work, and life in general. I stopped wearing the hijab in Kerala, in a natural turn of events. No one wore one so I stopped too. Also unlike in UAE, life didn’t stop during Ramadan in India. Class hours were the same. No changed schedules. Ramadan wasn’t a celebration, and I forever missed it. I forever missed having the nation celebrate my festival with me. I was constantly aware that I was a minority in my own home country. However, I never feared practicing my religion. There, I didn’t encounter any “Islamophobia”. I could dress up in religious garb, say I wanted to take a prayer break and do that, and openly practice my religion without any fear. However, the third part of my identity was constantly filled with fear. Me, the “woman”. India, as we all know, is not a safe place for women. And as young girls we were constantly made aware of that, by family members keeping a keen eye on us. I always had either my brother or mother (father was still working abroad) accompany me wherever I went. I started taking a rickshaw by myself when I was 15 years old. But as a girl/woman I never got used to travelling alone. My best friend once told me that the rickshaw driver flashed her. This was just “day-in-the-life” of any woman. And we were the protected ones, whose family had the finances and the time, to always opt for private transport. Despite that, we had a few of these harrowing incidents happen to us. Also, women in our family never prayed in mosques. So, my entire childhood in the UAE or India, I didn’t visit a mosque. It was only after I met my husband and his family, which was supportive of women praying in mosques, that I started going. And I loved it. I loved the communal feeling it gave me. I loved feeling like I belonged, not just as a “supporter” of men’s faith, but as having faith of my own for myself. So, I did go for Eid prayers in India with my husband and sometimes alone. I did attend a few Jumah prayers too, but since Friday was a working day this was rare. However again, I never went for Taraweehs in India, because I was either working at the time, or I didn’t want to be seen outside at that time of the night. We moved to US about 3 years ago, with a 9 month-old baby. My last article to MMW was when I had just moved to the US before I started working. I didn’t publish any articles in the years after, because I was consistently a sleep deprived mess for the rest of my time in the US. The Ramadan days were excruciatingly long. I was also a young mother, with no family support and working full time. One thing I loved about having moved to NJ, is being able to attend Imam Khalid Latif’s Eid sermons in New York. I have never had and will probably not continue to see such a liberal imam, or such a glorious, diverse amount of Muslims in the same space. I don’t expect to see another Eid Gaah were men and women share the same prayer space. And I don’t think I would ever see an imam, give a sermon in flesh. Not via CC TV , not via speakers, but just live, in person. I would for sure not see another imam carrying his son during the sermon. 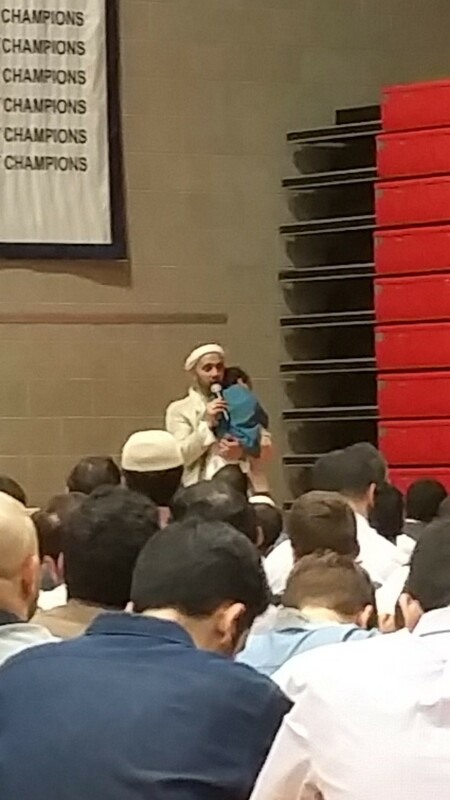 Imam holding son during Sermon in NY – Picture provided by author. But since I didn’t live in New York, I couldn’t visit the NYU mosque every day or even every Friday. It was an hour or more drive into the city, which was impossible with a small child. However, what drastically changed after I moved to the US, was “fear” in practicing my religion. The fear of being attacked if I was a hijab/abaya wearing Muslim, (especially on my way to the mosque) . I was also consistently concerned about all my Uber drivers. I wouldn’t dare walk at night to/from a mosque. Last Ramadan when a Muslim teen was killed her father stated that “he believes Nabra was killed because she was wearing an abaya, a traditional black cloak,” is what I read in the news every day. The news also showed people being shot dead by neighbors just because of being visibly Muslim. I generally feared for my life worried there might be a public shoot out or a bomb threat whenever I was at a mosque, or while doing regular “Muslim things” like praying in the Eid Gaah. Practicing my religion shouldn’t have to be about my courage. Hence, I prayed at home, and I fasted too. The days were really long, but we survived. My first day of my last Ramadan was at a theme park in Hershey’s. It was fun. But it was family fun. My social Ramadan was limited to, telling my colleagues, that I am not having lunch. Another reason for choosing not to go to a mosque for Taraweehs is women’s spaces in most mosques near me were crammed. In my hometown in India, it was the basement. In NJ, it was a floor albeit filled with woman and kids. I didn’t feel welcomed, and I didn’t feel like it was worth the hassle. However, when it came to expat/immigration kids integrating with the local kids and culture, US was the best. Kids learn to speak the local dialect fluently. Every kid is welcome to the local school, and most kids who are born in the US, are granted citizenship . I have always told my husband that we should move to Singapore because it is constantly featured as one of the safest countries in the world. Tamil is one of its local languages, and Islam is one of their prominent religions. Their president looks like this. That is a deadly combination if you ask me, as an Indian Muslim woman. Hijabis are a regular sight, due to its proximity to Muslim countries like Malaysia and Indonesia. This is also the first Ramadan that I have prayed Taraweehs in a mosque. While multiple factors led to that. All of these are because I live in Singapore, a country where I can practice my religion easily. Yesterday my husband had an important meeting, and I said I could go to prayers without him. 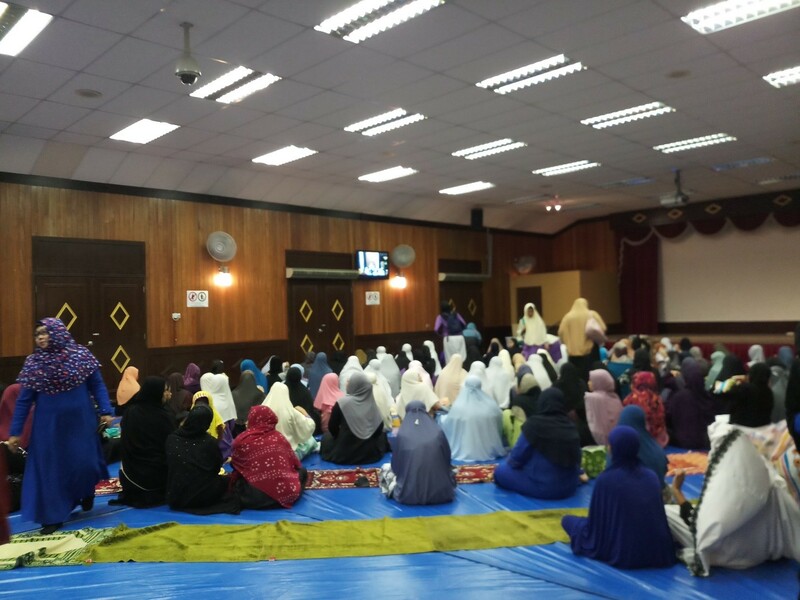 Women’s prayer area in Singapore Mosque- Image provided by the author. For me this idea in itself is radical. Taraweeh prayers are at night, I am a woman, thinking of travelling by myself. Almost impossible in my home country.Its late at night, I am a woman, in visible Muslim attire, travelling to a mosque at night. I could get killed in the west. I don’t drive, so I will either take a cab or take public transport. Both options are OK.
And the women’s prayer area in my local mosque is a glorious hall, with ample space. I cannot tell you how welcome that felt. It was a clean air-conditioned room with CCTV. A baby changing room, nursing room and child-minding included. Speaking about racial diversity, in Singapore like in Middle East, as long as we are on a work visa, the kids do go to expat schools. But in general people are extremely nice, and non-confrontational. I would take that over entitled white people any day. I am not adept enough to discuss systemic racism in Singapore, so let’s leave it at that. I went out for a few iftaar buffets because multiple places are hosting them. Singapore maybe far from perfect, but as a brown Muslim woman, I feel safe and happy in Singapore, for now, mashallah! Singapore is also the first country that I have worked in where Eid is a public holiday, and I am SO looking forward to that. Ramadan Mubarak everyone and Selamat Hari Raya!